Filled with farm fresh organic catnip, these fleece fortune cookies give your cat something to meow about. Will he finally catch that spider in the mudroom? Will the sun spot stay on the couch long enough for a good nap? With so many uncertainties in your cat's life, wouldn't it be nice to give him some hope for the future? 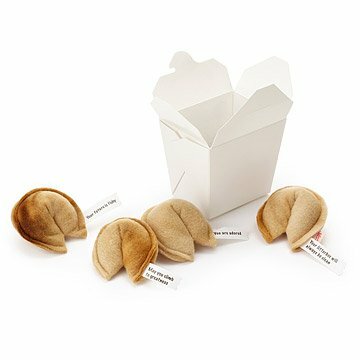 Filled with farm fresh organic catnip, each felt and fleece fortune cookie comes with a unique cat-themed fortune--now if only your four legged friend could figure out how to catch that little red dot. Handmade by Trish Iriye in Vallejo, California. Please note: fortunes are chosen at random. They will not be identical to the pictured combination. Cats love these!! They will choose them every time over other catnip toys. Every cat should enjoy these fortune catnip cookies! Love the presentation! Also love the clever fortunes! Can't wait until they open them! Wonderful gift for any cat lover. They're cute and highly effective. I purchased these catnip fortune cookies for my grandkitties in Washington DC. Unfortunately my cat Mai-Tai sniffed them out ripped open the box and played with them....no problem... Going to buy some more when I get home from work today since obviously they are a big hit at home. Amazing cat toy! It's a hit! I bought these for my friend's cat. He's spoiled rotten (has toys all over the house), as all cats should be, but he dropped everything to play with one of these fortune cookies! He even played with the box after he'd knocked the fortune cookie under the couch. He's been going at it for over an hour! The cats immediately ran over to these and the toy kept their interest for much longer than I expected. Actually ist's a Christmas presemt for my cats-so they haven't gotten it yet-HOWEVER they both love catnip & being totally indoor now (both were rescued off the street) they need entertaunment 24/7. I think the imaginative design is really cool-and they come in a Chinese type take-out box! ^It's hard to find NEW & DIFFERENT cat toys- to keep them interested & entertained-Thank you! She plays with it almost everyday. These were a perfect gift! The concept is original which makes it fun for the cats and their human pet!